If you know me, you know that I’m a huge nerd. I have been to other conferences before because my mom collects pens. I would go to all kinds of events and grab all the free pens for her. As many of you know, I’m studying to be a librarian and I run my own mobile library. Being able to go to this convention was a dream come true. All I did was spend a couple of hours volunteering. It was my first time at such a large convention. There were a couple things I missed out on, but I’m quick on my feet so I quickly adapted. I learned a lot of inside information while I was there. Now because I have a mobile library, I thought I didn’t have much use for the library furniture section of the convention, but it was cool and modern. It motivated me to push harder for grants to expand my library to an actual building one day. There were a lot of publishing companies. which is great for an author like me. It really opened me up to a whole world I didn’t know anything about. There were things I had never even heard of before. I felt so excited to be in the loop and privy to what is coming next for libraries. I absolutely love having things that you can’t buy in stores. I’m the king of person who loves knowing what’s going to be cool before people even know about it. I was on Facebook before it became popular. I used Spotify before it was even launched. My favorite things was buying clothes at a discounted rate for people that buy stuff to fill up their store inventory because I got free passes to the expo. If it’s free I’m getting it, because the only thing I love more than getting things for free, it’s giving stuff away for free. I went to this convention for free in exchange for volunteer hours. The best part is: a lot of conventions do this. Now here’s a secret for you: the best days to go to a convention are the first day and the last day. If you can’t afford to go to the entire convention, I would recommend going on just those days. Here’s why: The best giveaways will be on the first and last day. You could seriously miss out on some awesome goodies by not going the first day. Although I regret not going the first day, I was able to get books signed by the author because I went on Thursday which was also Teacher Day. There were still plenty of goodies, but it was clear that there had been a lot more of them. You could instantly tell which booths were giving away goodies by the lines. The ladies there were very nice whenever you asked what the line was for. At some booths, you could only take one book, but the Penguin Random House booth let me take 6 free books. I would have gotten back in line, but one must make difficult choices when you’re just one person and you’re already struggling to carry 35 pounds of books. I needed a friend to help me out, but I did well for carrying everything myself. The final total was 97 books. Some were galleys or a mock-up, some were advanced reading copies, and some were given away because the conference was over and they hadn’t been sold yet. I took everything they would give me like bookmarks, posters, pencils, pens, etc. The best idea I’ve had was to bring my dolly with me and it made it so much easier to carry everything home. I even got some valuable information from people who have been librarians for over 20 years. I had so much fun, and it made me wish I had a job of just going to conventions. It would be amazing if I could travel all over the country going to conventions and seeing what the future holds. 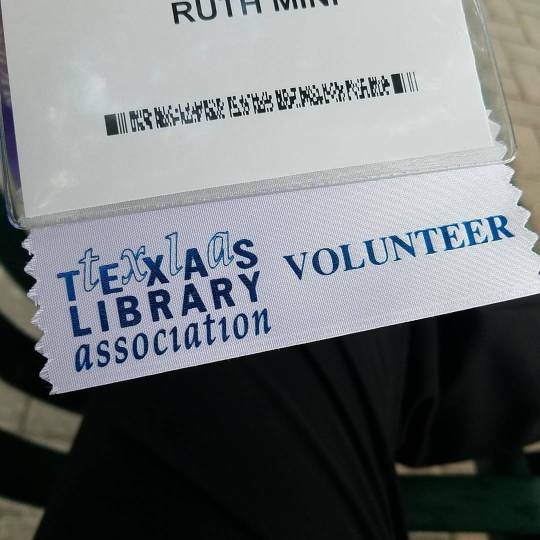 Overall, the Texas Library Association Conference was a success. It was fun, cool, and awesome in general, but I may have a biased opinion. I loved being around people with similar interests who are not competing with me to get a job so they are willing to help me and guide me. It feels good to finally know what you want to do with your life. 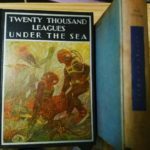 If you want more information, check out my library page.